A Permanent Account Number or PAN card is an important document a citizen must hold in India. It is used as a form of identity and once you start earning PAN card is necessary to file income tax returns. . A PAN card can be issued to citizens of India (including minors), non-resident Indians (NRIs), and even foreign citizens. The procedure for application varies for these categories of people but if you are an Indian citizen and wondering how you can apply for PAN card online, well this article is your answer to all your queries. Application for fresh allotment of PAN can be made through Internet all thanks to part of Digital India. Online application can be made either through the portal of NSDL ( https://tin.tin.nsdl.com/pan/index.html) or portal of UTITSL (https://www.utiitsl.com/UTIITSL_SITE/pan/index.html). You can use any one of these websites. •	After selecting the website you will be redirected to a page where you will be required to fill your personal details such as name, date of birth, mobile number, etc., after finishing click Submit. 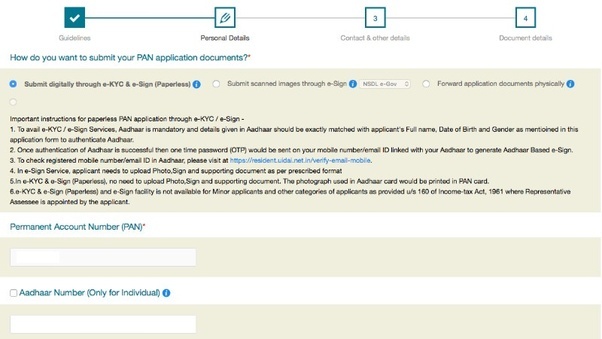 Also note that under Application type select New PAN - Indian Citizen (Form 49A). If you’re a foreign national, select New PAN - Foreign Citizen (Form 49AA).Also, select the category of PAN card you need. For most people, this will be Individual. •	The page asks you for authentication documents usually it will be authentication by Aadhar. The other options require you to send scanned documents such as three months old electricity bill or broadband connection bill or water bill and birth certificate issued by the Municipal Authority. The easy method is the Aadhar card verification. •	In the authentication via Aadhaar enter all details such as Aadhaar number (optional) as requested on screen, and click Next. •	This step requires you to fill in your name, date of birth, address, etc. Do that, and click next. •	This step is the tricky part, you will be required to choose AO Code, select your state and area of residence. Then wait for a few seconds and you will see a full list of AO codes in the box below. Carefully scroll and look for the category that applies best to you. There are different categories for companies, non-salaried people, government servants, private sector employees, etc. If you don’t know which category you fall under, contact a chartered accountant to find out. Click on the correct AO code and it’ll be auto-filled in the form. Click Next. •	Now, select the documents you have submitted as proof of age and residence from the drop-down menu, fill in required details, and then click Submit. •	Then you will be redirected to the payment page and you can choose one of many common online payment methods. The fee for PAN card applications for Indian citizens is Rs. 115.90 inclusive of all taxes. A small fee is added to this as online payment charges so the total works out to around Rs. 120. •	Once you have paid, you will be asked to authenticate via Aadhaar OTP, or submit documents via e-sign, or to physically send the documents to NSDL. Select the most appropriate option. •	Once done, you will receive an email acknowledgement from NSDL about your application and your PAN card will be couriered to you once the application has been processed. Congratulations! You have successfully applied for the PAN card. Note: Keep the acknowledgement number safe, it may be required for further use.